Enterprise Zones are one of many policies that have persisted over the years without the presence of much hard evidence to support their effectiveness or worthiness of public dollars. Timothy P.R. Weaver offers a compelling reason why this occurs: ideas matter more than the material outcomes they generate. The notion that ideas, more than interests and institutions, can drive decades of policy decisions runs throughout Blazing the Neoliberal Trail, and it is conveyed through a meticulous political-historical account of urban policy in the United States and the United Kingdom. Weaver brings to bear theories and perspectives on urban economic development from a wide range of disciplines and, as he states, “pays close attention to the sequencing of political change” (p. 116) to cumulatively challenge the prevailing thought on the neoliberal turn (or lack thereof) in urban politics and policy. Weaver does not examine the urban context in a vacuum, and he is very committed to the fact that cities are creatures of the state and that political development takes place at various levels of government. Indeed, cities, and Enterprise Zones specifically, proved to be a powerful setting for operationalizing neoliberal ideas. Still, this institutional reality is not deterministic in his account, as he adeptly shows through his comparative analysis. In the United States, a case of neoliberalism by default, the institutional context created obstacles; in the United Kingdom, a case of neoliberalism by design, it created opportunities. And yet in both cases, ideas ruled across apparent ideological divides. 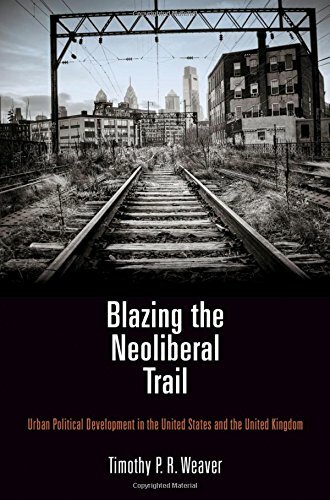 Weaver shows that an idea such as Enterprise Zones can appeal across “the aisle” and across history: it embraces neoliberal tendencies toward business interests and tax incentives while at the same time aiming to solve social ills such as unemployment that undergird progressive ideals. As time went by, Enterprise Zones were a ready-made, socially conscious neoliberal policy waiting for the right problem. Without any alternative, the result was the “remarkable endurance of a policy regime that has consistently failed to produce positive results” (p. 281). While Weaver is comprehensive in his tracing of national and local political and institutional trajectories, there is one important omission—one that could further inform the urban neoliberal turn that the book aims to disaggregate: urban renewal. Both the United States and the United Kingdom have checkered pasts with urban renewal, a stark example of direct government intervention in urban revitalization. How much did experiences with this approach drive the move toward a more neoliberal strategy like Enterprise Zones? This is not to say that the neoliberal converging that Weaver demonstrates did not take place, but rather it is to question whether other urban policies such as urban renewal were as irrelevant as the book’s narrative conveys. Weaver’s conclusion is not an optimistic one, insisting that any development of policies that present “realistic alternatives” to the neoliberal “ideological infrastructure” will take decades (p. 283). As he demonstrates, it took just as long to create the economic inequalities observed today. However, is there not more to learn from his research? Are there structural differences between the neoliberalism by default and by design that can be articulated to draft a strategy for urban development moving forward? What is the fate of inclusive urban development? What Blazing the Neoliberal Trail tells us is that these kinds of solutions may not come from higher levels of government. Indeed, in order to combat the trickle-down expectations of neoliberalism, we will instead need a robust trickle-up movement.